The Giza plateau is composed of limestone, a geological feature which creates natural crevices and pockets in the stone somewhat like Swiss cheese. Perhaps not so strange then that Giza was known anciently as 'Rostau', meaning the "mouth of the passages". Reports of cavities and underground tunnels at Giza have circulated for thousands of years, and the discovery of several are recorded, but if an underground complex or hall of records exists, as is suspected by many, it has thus far remained elusive. The following is a review of the known underground chambers and tunnels at Giza. The Limestone pavement surrounding the pyramid complex was built over existing crevices and holes in the limestone as seen in the picture above taken next to the great pyramid. 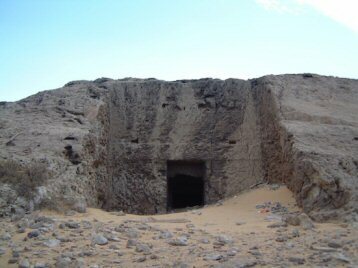 The 'Well shaft' is a tunnel that runs down into the bedrock for over 200 feet beneath the great pyramid, connecting the upper parts with the lower subterranean chamber. It has been proposed to have been originally cut for several purposes: To provide air for the builders, to provide access for repairs to the kings chambers, or as an escape route for the workmen who lowered the granite plugs into place or finally, for tomb robbers. All of these theories however, have objections. The Well-shaft was cut through the natural bedrock beneath the Grotto. As the pyramid was built over it, the Grotto was blocked covered over. A small section of lined tunnel was left concealed into the masonry at the top end, then covered over with a blocking stone. The two sections of the tunnel were connected at a later date by someone who cut roughly through the masonry of the pyramid, gaining access to the hidden tunnel and upper parts. The Great pyramid was built with several tunnels and chambers in it, most of which were designed to remain hidden. Whilst we assume that the major tunnels have been found, rumours still abound that other cavities and tunnels exist to be discovered within the structure. 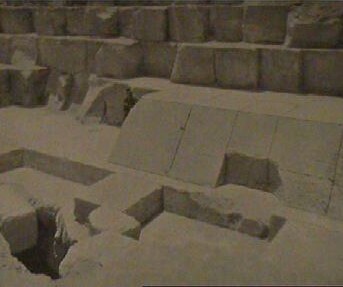 Of the numerous reports and explorations of the pyramid, one fact remains true: The well-shaft was accurately cut (28" x 28") through hundreds of metres of bedrock and sealed off at the top as the pyramid was built over it, however, the top tunnel section which was hidden into the masonry was left there for a reason, and whoever it was that breached the upper section of the the well-shaft were well aware of its location, and were undoubtedly the first people to gain access to the upper parts of the pyramid since its construction. Although generally considered a minor feature of the Great pyramid, the well-shaft potentially holds one of the key secrets of the Giza complex, albeit one for which we may no longer be able to find an answer today. 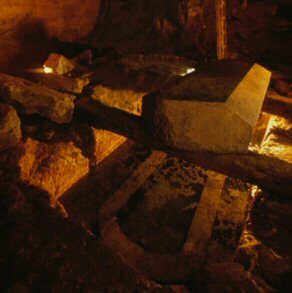 The true significance of the incorporation of this natural feature into the design of the Great pyramid is realised by several geometric facts which show that the builders not only built the tunnel in accordance to a known plan, but that the 'Grotto' within it, may have been the inspiration for the great pyramid itself. 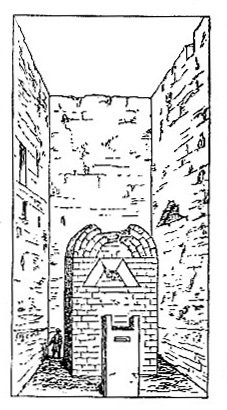 It is noted for example, that the upper entrance of the tunnel is at the exact junction of the change in architecture and style of masonry in the Ascending corridor and Grand Gallery (from tunnel to vaulted chamber), simultaneously marking the level and start of the tunnel leading to the 'Queens chamber'. 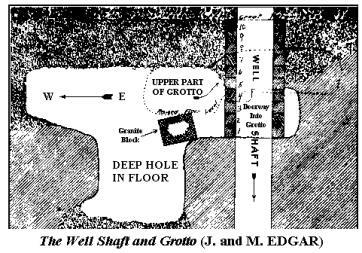 In addition, the 'grotto' within the well-shaft is located at the same level as the granite plugs in the ascending passage, and perhaps most importantly - lies on the central north/south axis of the pyramid itself. 'The ceiling is unusually damp to the point where there is actually a perceptible coating - like a light frost - over the pebbles themselves. This unusual composition naturally tempts one to speculate about the existence of a nearby water source'. In August 2009, British author Andrew Collins and researcher Nigel Skinner-Simpson announced that they had made a fortuitous discovery on the Giza Plateau: The Rediscovery of the Tomb of Eagles. The cave system was first explored by Henry Salt (the British Consul General) and Giovanni Caviglia in 1817, who entered through a rock-cut tomb. However, the existence of these caves was subsequently forgotten. Colonel Howard Vyse, who conducted excavations on the Giza Plateau in 1837, wrote about the tomb in his 1840 book. The site turned out to contain several mummies of birds, which Vyse and engineer John Shae Perring apparently removed. Collins relocated the lost tomb in January 2007 in the company of his wife, Sue. They found little, other than further evidence of a local bird cult practised within this structure. 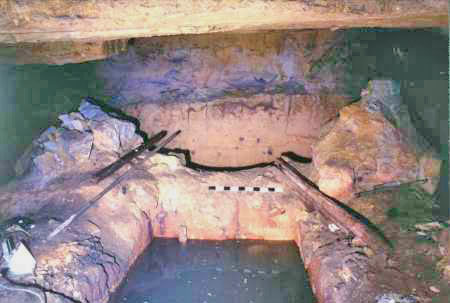 When Salt’s memoirs were published in 2007, Collins and Skinner-Simpson realised that they contained a detailed account of the exploration of the catacombs. The explorers had apparently penetrated “several hundred yards” into this structure before coming upon a spacious chamber that connected with three others of equal size, from which went labyrinthine passages. Caviglia later pursued one of these passages for a distance of “300 feet further” before giving up, the two men being put off by the fact that they had not found anything of value—no gold, no treasure, the primary obsession of these early pyramid explorers. On 3 March 2008, Sue and Andy Collins, together with Nigel Skinner-Simpson, went back to the newly baptised Tomb of the Birds, having gained sponsorship from the Association for Research and Enlightenment (ARE) in Virginia Beach, Virginia, USA. After some searching, they found a small crack in the rock face that led into a huge natural cave chamber which connected with other cave compartments and a long cave passage. In short, the trio realised that their structure coincided with the caves discovered in 1817. At present, no-one knows the total extent of the caves. Were the caves to continue beyond the farthest point reached, they would most likely head off in the direction of the Second Pyramid (The Pyramid of Khafre), whose south-western corner is only 480 metres southwest from the entrance to the Tomb of the Birds. The tomb NC2 is generally accepted as being an Old Kingdom construction. If this is correct, then the tomb and caves would have been known during the Pyramid age. however, if the Tomb of the Birds began as a natural cavity, then it is likely that the tomb built into it that the caves might have been accessible long before this time. 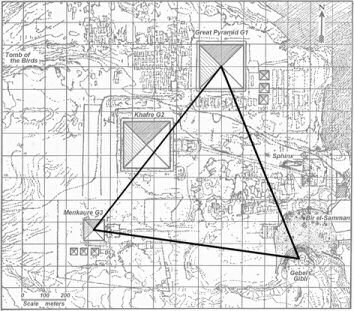 (Above left), the equilateral triangle formed by linking the peak of Gebel Gibli (bottom right) with the apexes of the Great Pyramid and Third Pyramid. 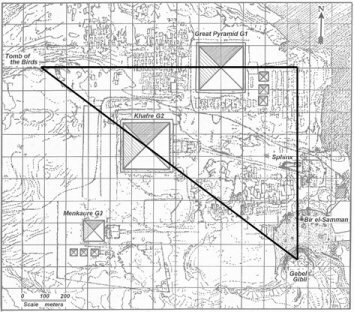 (Above right), the 3:4:5 Pythagorean triangle embracing the summit of Gebel Gibli and the apexes of the Great Pyramid and Second Pyramid. The head of the Sphinx sits along the side of the triangle's north-south line, the centre of Khufu's pyramid lies on the Northern line, and the centre of Khafre's pyramid lies on the Hypotenuse. The Two forms of Geometry superimposed. Gebel Gibli Hill is the vantage point from which it is suggested the geometry of Giza was originally calculated. 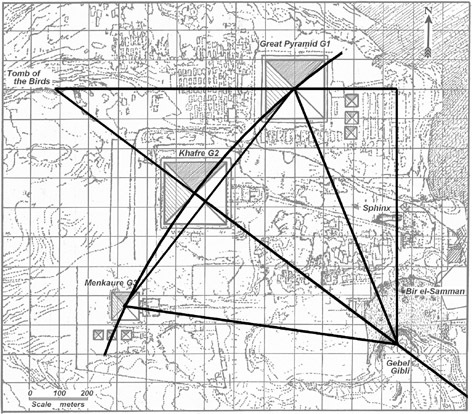 Mark Lehner used the same location when he surveyed Giza. 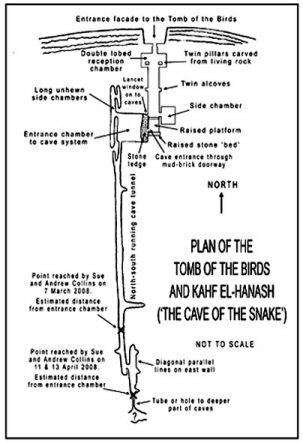 In a curious twist to this discovery, the now infamous Zahi Hawass, made several controversial public claims concerning the rediscovery of the cave system at the back of the Tomb of the Birds, all of which are on the public record. He first denied the existence of any natural cave system, following which he stated categorically that it had been previously 'explored and reported by many scholars', for which there is no record. He then proceeded to excavate the site himself for several months, and fitted a metal gate across the entrance. The results of his excavations have yet to be released to the public. Campbell's tomb: 'The Tomb of Osiris'. The 'Tomb of Osiris': The tomb is located approx 30m beneath the large square opening at the rear of the Sphinx. Campbell's Tomb was named after Colonel Patrick Campbell, the British Consul who supported the work of Howard Vyse and Giovanni Caviglia at Giza). It is a matter of record that in 1830 Colonel Vyse found this very wide shaft (it is thought that at least 10,000 tonnes of limestone had been dug out of it! ), almost square (9m x 8m), surrounded on all sides by a deep trench. On 11 February 1837, when the sand had been cleared out of it to a depth of more than 30m, he reached what he thought was the bottom, where he recorded finding a number of sarcophagi, one of which is made of basalt, now resides in the British Museum. His excavation revealed only the upper parts of the tomb, which consisted of a secondary burial, generally agreed to be from the 26th dynasty. 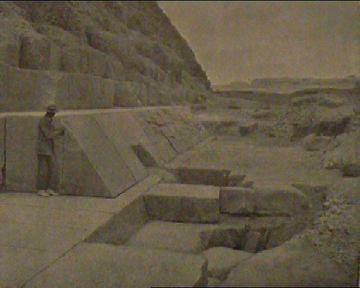 'Upon the surface of the causeway they first built a platform in the shape of a mastaba, using stones taken from the ruins of the covered corridor of the causeway. 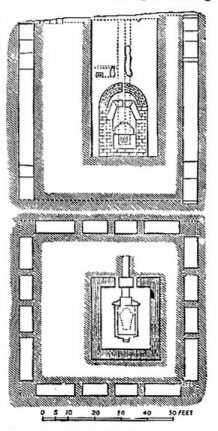 In the centre of this superstructure they sank a shaft, which passed through the roof and floor of the subway running under the causeway to a depth of about 9.00 m. At the bottom of this shaft is a rectangular chamber, in the floor of the eastern side of which is another shaft. This descends about 14.00 m. and terminates in a spacious hall surrounded by seven burial-chambers, in each of which is a sarcophagus. Two of these sarcophagi, which are of basalt and are monolithic, are so enormous that at first we wondered if they contained the bodies of sacred bulls. In the eastern side of this hall is yet another shaft, about 10.00 m. deep, but unfortunately it is flooded. Through the clear water we can see that it ends in a colonnaded hall, also having side-chambers containing sarcophagi. We tried in vain to pump out the water, but it seems that a spring must have broken through the rock, for continual daily pumping over a period of four years was unable to reduce the water-level. I may add that I had this water analysed and finding it pure utilized it for drinking purposes' (Hassan 1944: 193). Hassan makes mention of a "subway running under the causeway." All this term refers to is a small tunnel burrowed under the causeway of Khafre's pyramid complex. This tunnel probably served as a shortcut for priests and other temple personnel to bypass the causeway; a similar bypass was excavated under the remains of Khufu's ruined causeway, to the north (Hawass 2007: 395). Hassan's journal illustrates what has become an unfortunate trend when it comes to important discoveries, namely the discrepancy in the number of sarcophagi he saw and the number present today. The Giza site has been under close scrutiny by the Egyptian authorities since Hassan's time, yet there are now five sarcophagi missing, yet no questions have been posed as to what had happened to the other five. 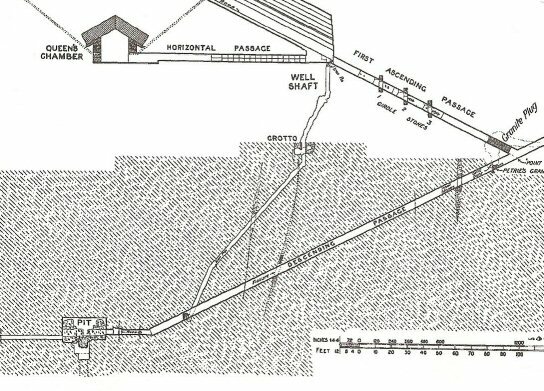 Schematic diagram of tunnel system showing the 'Tomb of Osiris' approx 30m beneath the rear of the Sphinx. The granite lid being lifted (left), and side-view (right) showing the remains of the columns. The Following Extracts are From Zahi Hawass (1). 'I believe that the Osiris Shaft is what the Greek author Herodotus, the “father of history,” was talking about when he said that Khufu was buried on an island in an underground chamber, located in the shadow of the Great Pyramid and fed by a canal from the Nile'. 'I made my second discovery from this excavation after moving the lid of the sarcophagus. I found inscribed in the ground the hieroglyphic word "pr", meaning "house." It is known that the Giza plateau was called "pr wsir nb rstaw", or "the house of Osiris, Lord of Rastaw." "Rastaw"(rostau) means the 'Mouth of the passages". 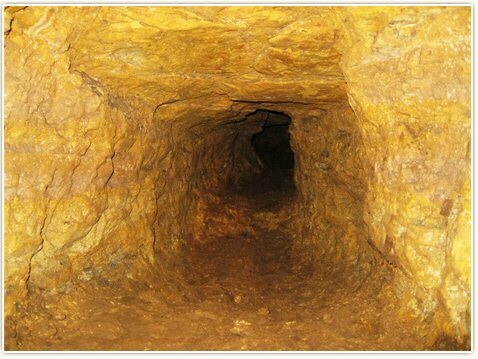 What remains one of the most interesting unexplored features of the Osiris shaft is the narrow tunnel that extends from the northwest corner of the lowest level. This tunnel appears carved but is only large enough to admit a young child at its entrance, and further along, it becomes filled with mud. At about 6.5 meters, the a branch splits off the tunnel. A camera has been sent 10.5 meters into this branch before it became too narrow and muddy for the rovers to go any further. The main tunnel has been determined to extend for a total length of about 21 meters, where it seems to end, although it has been impossible to determine this with certainty. There have been rumours of passageways and secret chambers surrounding the Sphinx and during recent restoration work several small tunnels have been re-discovered. One, near the rear of the statue extends down into it for about nine yards. Another, behind the head, is a short dead-end shaft. The third, located mid-way between the tail and the paws, was opened during restoration work in the 1920's, then resealed. It is unknown whether these tunnels were constructed by the original Egyptian designers, or were cut into the statue at a later date. 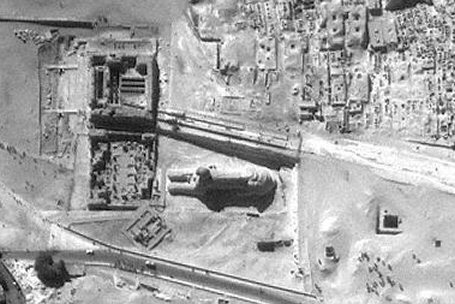 In 1987 a Japanese team from Waseda University (Tokyo), under the direction of Sakuji Yoshimura carried out an electromagnetic sounding survey of the Khufu Pyramid and Sphinx. They reported evidence of a tunnel oriented north-south under the Sphinx, a water pocket 2.5 to 3 m below surface near the south hind paw, and another cavity near the north hind paw. In 1991 a team consisting of geologist Robert Schoch (Boston University), Thomas Dobecki, and John Anthony West carried out a survey of the Sphinx using seismic refraction, refraction tomography, and seismic reflection. The investigators interpreted their data to indicate shallower subsurface weathering patterns toward the back and deeper weathering toward the front, which they take to indicate that the back of the Sphinx and its ditch were carved by Khafre later than the front. They interpret their data to likewise indicate subsurface cavities in front of the front left paw, and from the left paw back along the south flank. Apart from the north-south tunnel found by the Japanese team, it appears (at present) that there is no 'Hall of Records', or other substantial man-made tunnels or cavities to be found beneath the Sphinx. However, a recent story emerged of tunnelling occurring in the village in front of the sphinx which has startling implications on the whole future concept of the Giza plateau. 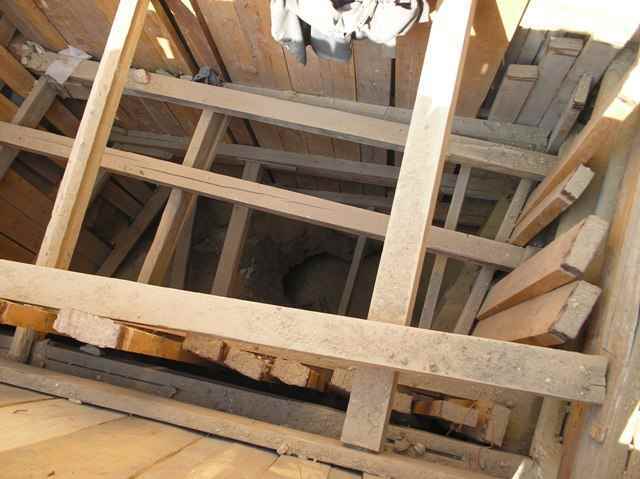 In 2009, a story emerged of a collapsed illegal tunnel in the Giza village of Nazlet El Smaan, causing the deaths of 6 men. Although very little was made of the story, a selection of photographs and recorded conversations proved that tunnelling beneath the houses was being financed and operated surreptitiously and rumours were surfacing that that major finds were being discovered. Following the collapse, the site was abandoned and now lies derelict in the middle of the village. 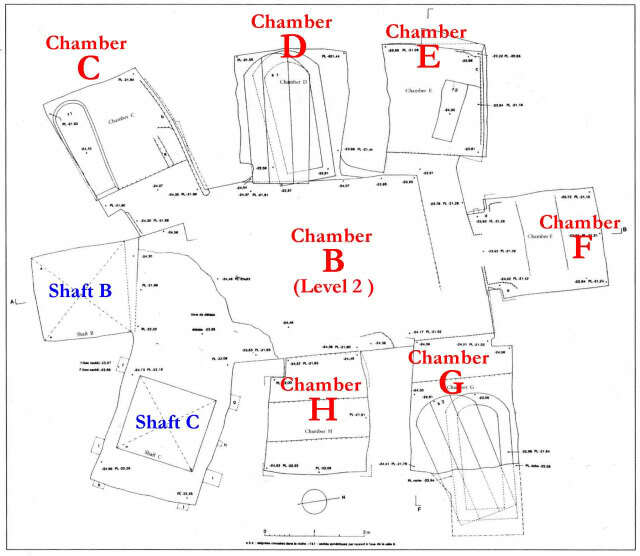 Perhaps less well known is that the very same spot had been identified in publications years before by Zahi Hawass and Mark Lehner as the most likely position for the undiscovered Palace/Tomb of Khufu. 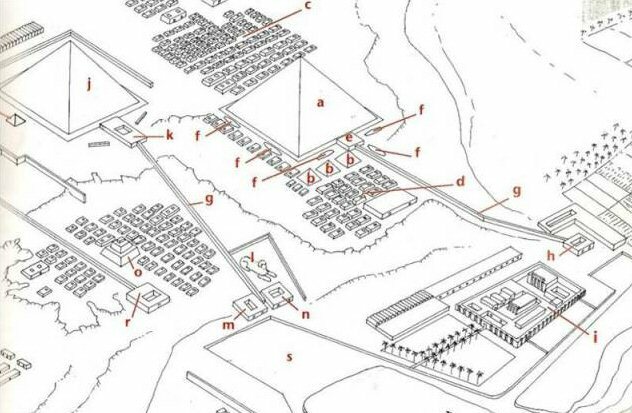 Map of the Giza complex showing the undiscovered Palace/Tomb of Khufu (Bottom right). In 2010, Digging was commenced in front of the Sphinx. As yet, no explanation has been given for the 4-story deep excavation. 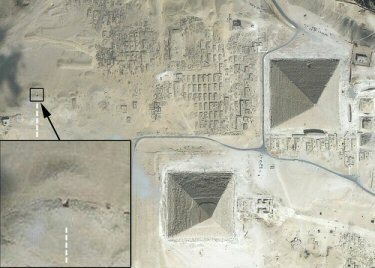 Is this a step towards rediscovering the lost Palace of Khufu...? 'There are secret tunnels under the Sphinx and around the Pyramids which will prove to carry many secrets of the building of the Pyramids." 10).J. P. Lepre. 1990. The Egyptian Pyramids- A Comprehensive, Illustrated Reference. McFarland And Co Publ.